But unlike vSAN Observer, SexiGraf makes vSAN Monitor persistent because when you need it you most likely want to know what just happened. Since you have to launch vSAN Observer and wait few minutes, that particular moment is gone. 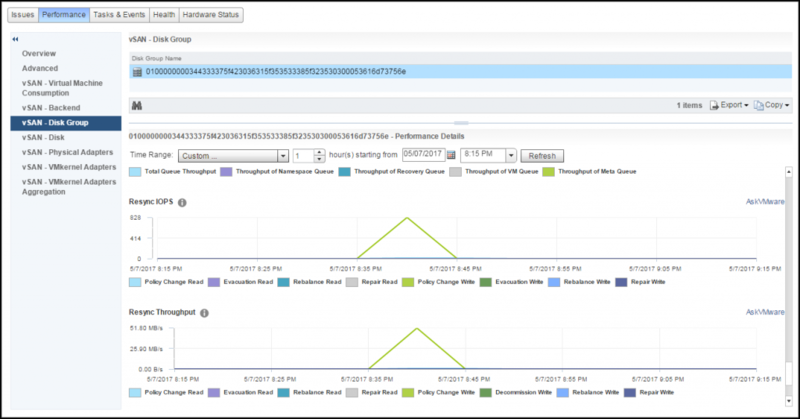 vSAN Monitor let you explore 6 months from now so you can relax. Nevertheless, vSAN Monitor is NOT a replacement for vSAN Observer since it only offers the primary “tabs” where you’ll be able to check the global activity of your vSAN cluster per nodes. When you need to deep dive, you’ll still need vSAN Observer. Badly. Since some brillant guys at VMware already explain how to read vSAN metrics, you’ll need to check those papers if you not already did : Monitoring VMware Virtual SAN with Virtual SAN Observer & VMware Virtual SAN Diagnostics and Troubleshooting Reference Manual. 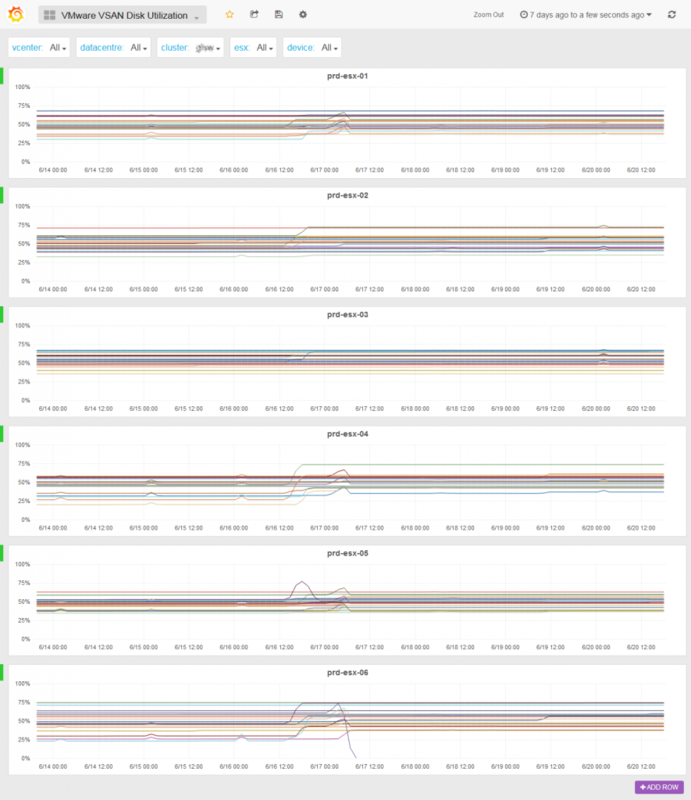 Client: This view shows vSAN statistics from the view point of the vSAN client running on each host. 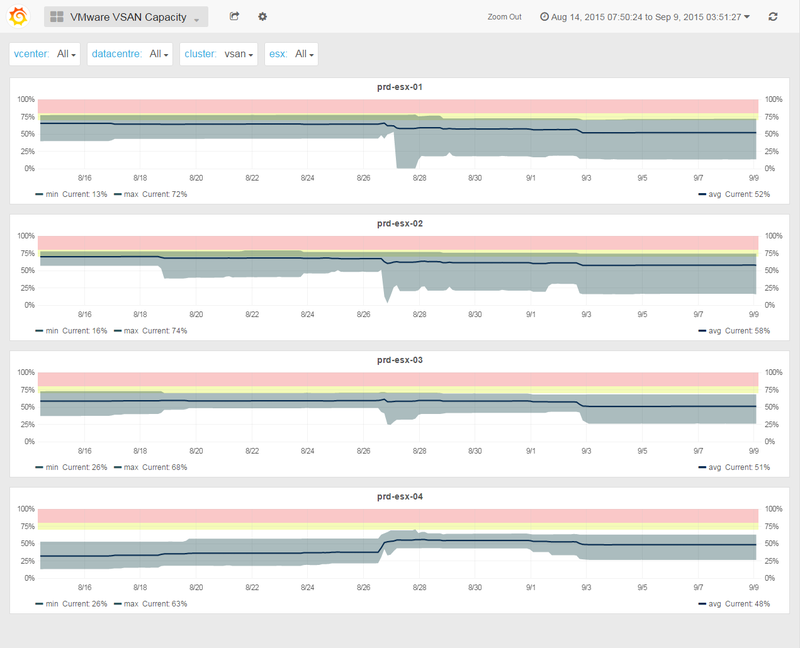 In other words, this view represents the vSAN performance as seen by VMs running on the hosts for which statistics are shown. If this view shows any unexpected performance, one needs to drill down further to understand where performance issues may be coming from. 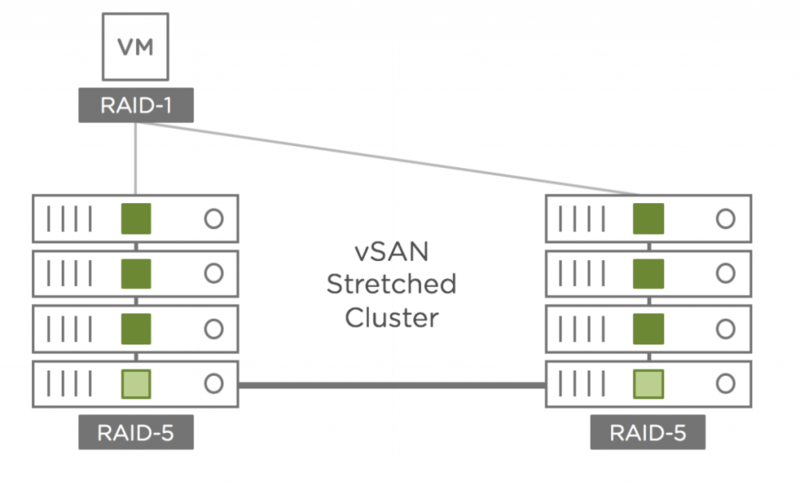 It is important to understand that due to the distributed nature of vSAN each host accesses data from all hosts, so any performance issue seen on this view may be caused by any host in the vSAN cluster. Disks: This view shows vSAN statistics of the physical disk layer of each host. In other words, this view allows to determine if there is any contention on any of the disk groups that make up the overall vSAN cluster. Note that the statistics shown are purely the physical disk layer and do not include any other vSAN overhead (e.g. networking or vSAN RAID). Also remember that due to the distributed nature of vSAN the physical disks of one host are accessed by VMs on all hosts in the vSAN cluster. If this view shows physical disk contention across a majority of hosts then this likely indicates that the workload run by VMs is collectively higher than the vSAN cluster can handle. In that case, either reduce the storage workload, or check the detailed physical device view to determine if you need more HDDs or SSDs. If however only a single host’s physical disks are contended, while other hosts are operating fine, then you may have an imbalance, e.g. caused by particularly noisy VMs. Owner: The DOM owner is a vSAN internal layer. For every vSAN object vSAN elects one host to be the ‘owner’. The owner performance all RAID functionality and ensures correctness, even under concurrent access by multiple clients. All IO flows from the vSAN client to the owner and then to the disk layer. vSAN tries to co-locate the owner and the client to not incur an additional network hop. However, the user can’t influence where the owner for a given object is located, so reading the below graphs and correlating them with the client and disks graphs can be very difficult. 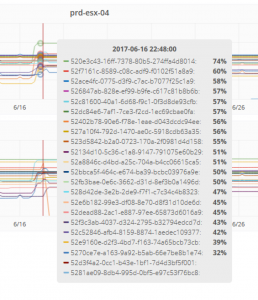 You may have noticed the last column is not Latency stddev but Read Cache Hit Rate since we believe it offers a more syntetic view. We also got thresholds like vSAN Observer but Grafana’s are areas so you know exaclty when the metric hits the roof and for how long. 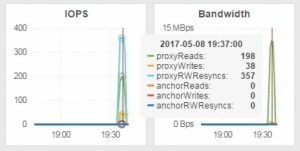 As per vSAN Observer settings, the threshold for latency is 30ms, 20 for congestion and 30 for latency SD. All-flash clusters have two types of flash: very fast and durable write cache, and more capacious and cost-effective capacity flash. Here cache is 100% allocated for writes, as read performance from capacity flash is more than sufficient. 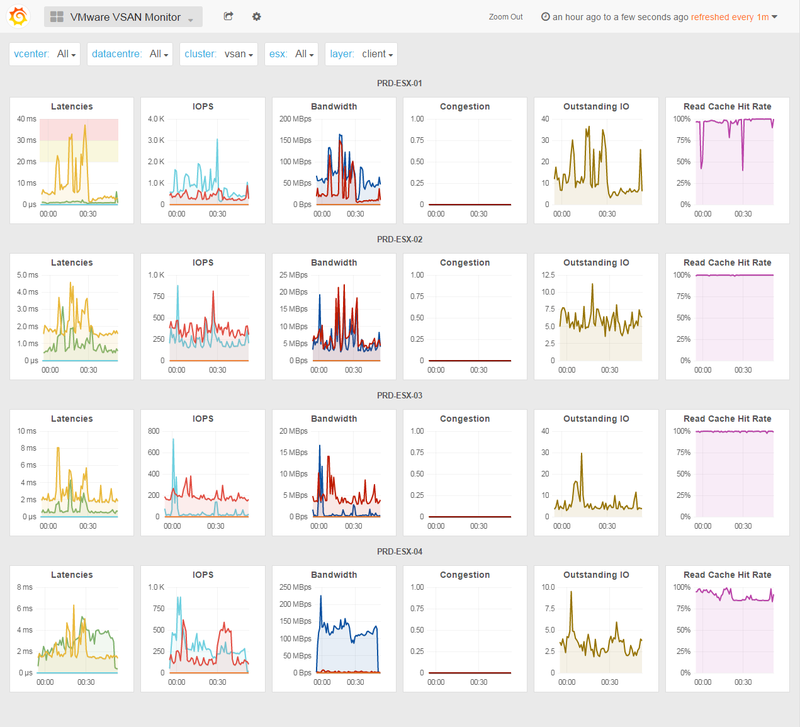 Support for vSAN 6.6 APIs has been added to SexiGraf 0.99d so for those having ESXi 6.5.0d+ vSAN cluster with v5 on-disk format, we’ve created an enhanced vSAN Monitor 66 dashboard with the new resyncRead and client.cachestats metrics. As of 6.2 vSAN also has a small in-memory read cache. Small in this case means 0.4% of a host’s memory capacity up to a max of 1GB. Note that this in-memory cache is a client side cache, meaning that the blocks of a VM are cached on the host where the VM is located. Starting with vSAN 6.6, it is possible to configure a secondary level of failures to tolerate. This feature enables resiliency within a site, as well as, across sites. For example, RAID-5 erasure coding protects objects within the same site while RAID-1 mirroring protects these same objects across sites. 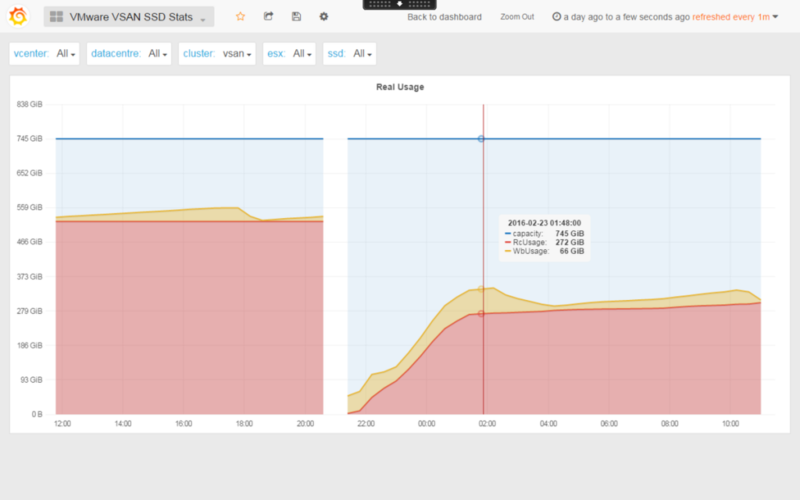 Since we had some free space left on the dashboard, we also added some UNMAP metrics. As per VMware Virtual SAN 6.0 Design and Sizing Guide: “VMware is recommending, if possible, 30% free capacity across the Virtual SAN datastore. The reasoning for this slack space size is that Virtual SAN begins automatic rebalancing when a disk reaches the 80% full threshold, generating rebuild traffic on the cluster”. 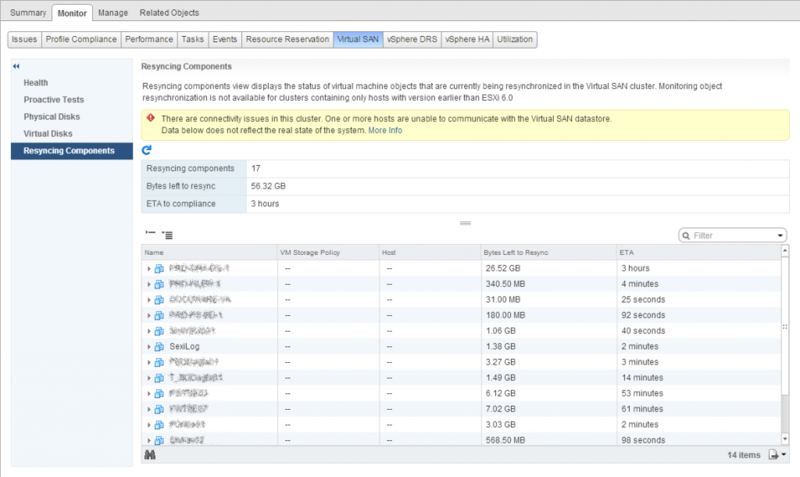 Moreover, if one disk (or flash capacity) of a disk group is full, the VM with objects on it are stunned until vSAN has finish the rebalance of the objects. 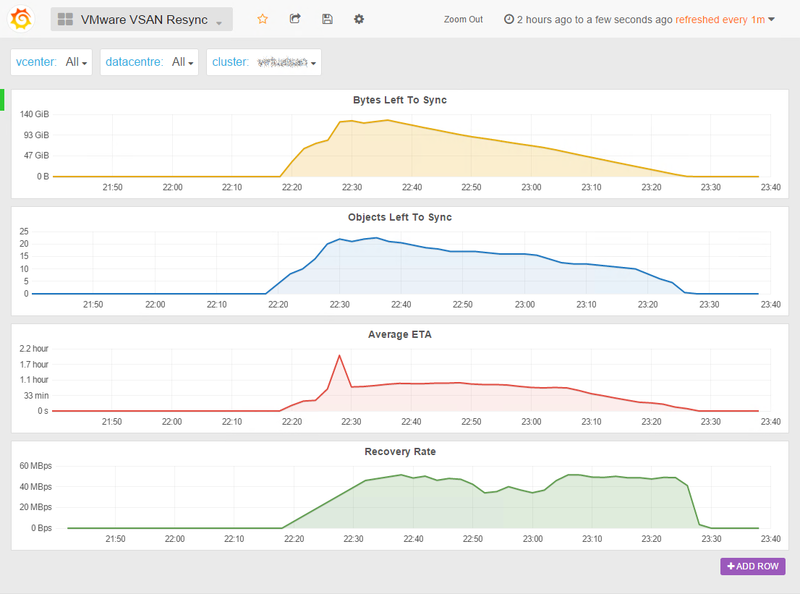 In vSAN Observer, you can check the upper, lower and average disk (or flash capacity) usage per host but not per cluster and most importantly you won’t be able to see the trend so you won’t be able to predict anything. 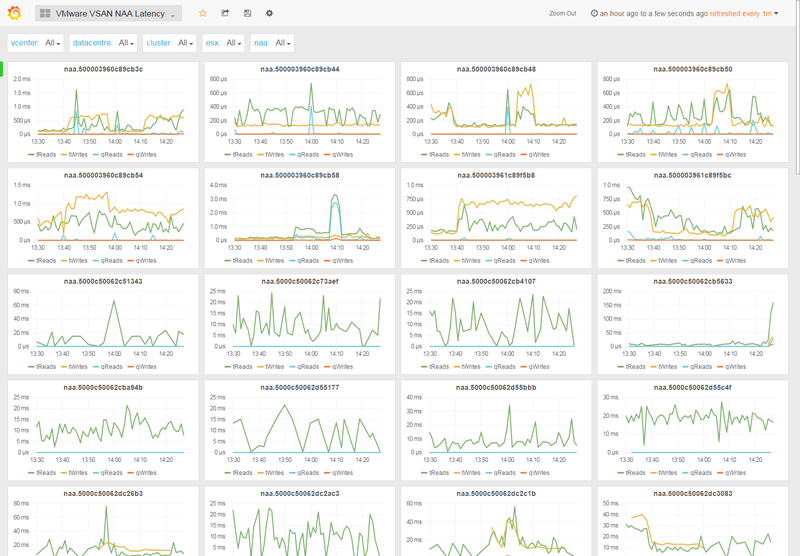 The vSAN Capacity dashboard shows you the nodes capacity metrics of the entire cluster and allow you to anticipate futur storage needs. For each host, the shadow represents the min/max area of the diskgroups and the dark line represents the average. 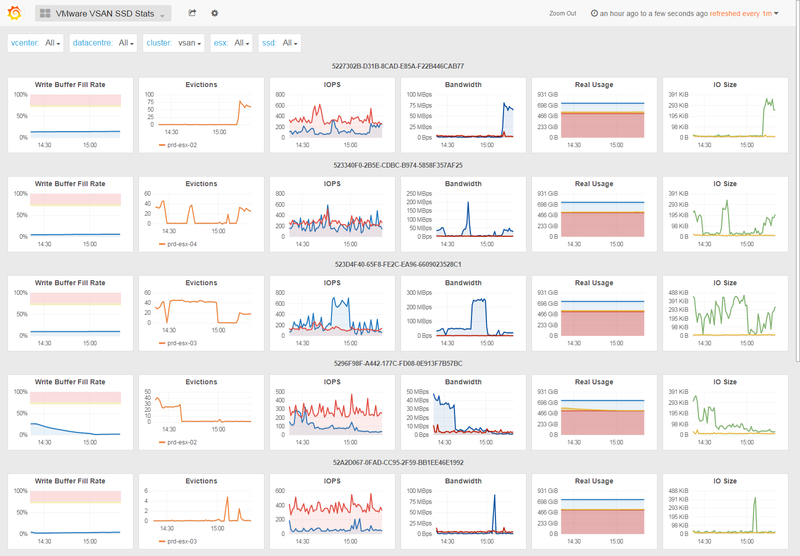 The vSAN SSD Stats dashboard shows various statistics from the caching devices of the vSAN diskgroups. The Write Buffer Fill Rate graph is probably the most important as it helps to understand how fast the write buffer fills up and how fast the data are flushed on disk (or flash capacity). As per vSAN Observer settings, the threshold of this metric is 75%. 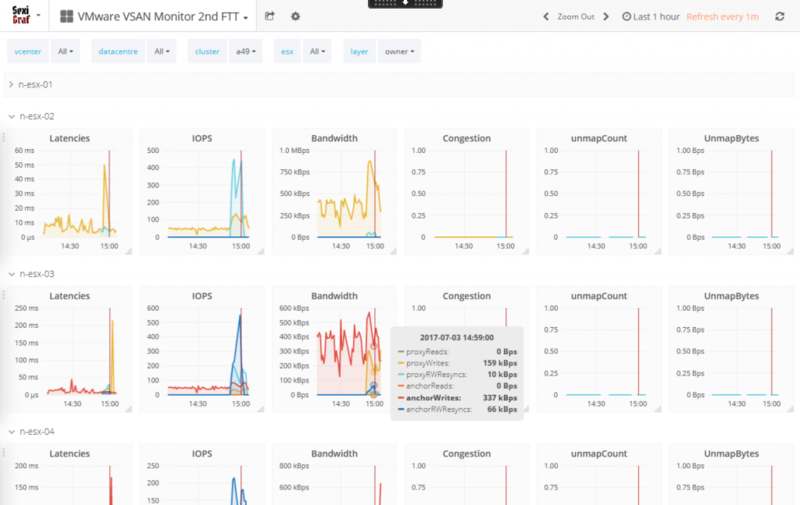 The IOPS and Bandwidth graph are obviously speaking for themselves. 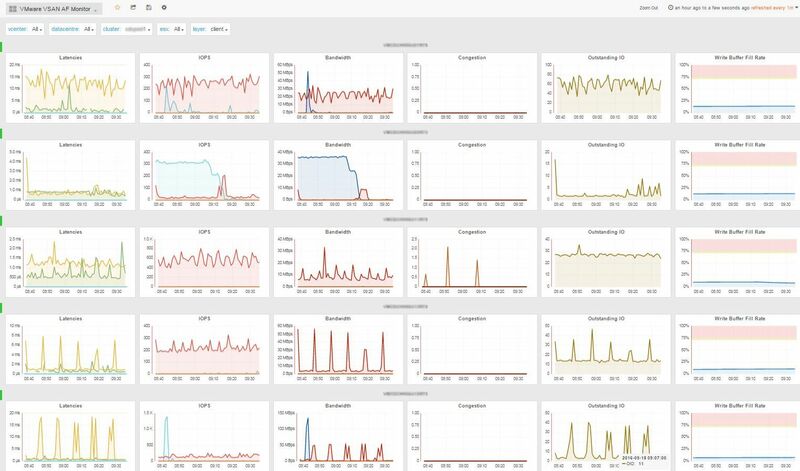 Starting from SexiGraf 0.99b we’ve added 2 new rows: Real Usage that let you monitor the vSAN flash tier filling up and IO Size that speaks for itself. The Real Usage row may be very usefull to measure read cache warm up duration. Now you can really see what’s going on when objects are being resynced, rebuilded or rebalanced. 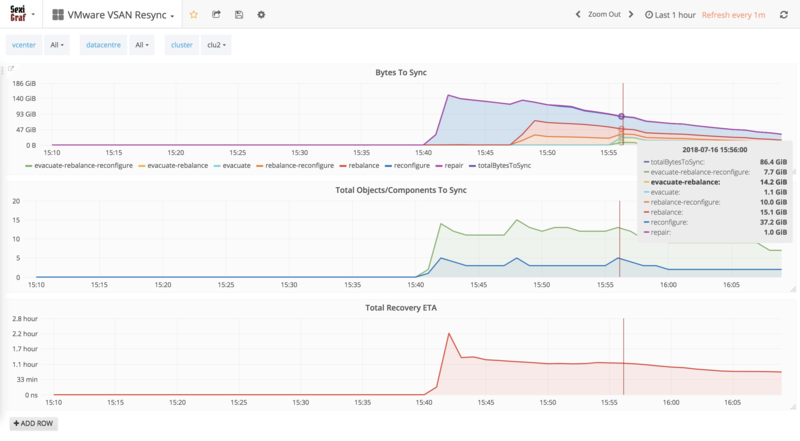 We also added a Recovery Rate graph to check how fast your vSAN backend performs. dying_evacuate: The component is being moved out when a disk is going to die. evacuate: The component is created and resyncing after evacuate disk group or host to ensure accessibility and full data evacuation. rebalance: The component is created and resyncing for rebalancing. reconfigure: The component is created and resyncing after vSAN object was resized or its policy was changed. repair: The component is created and resyncing to repair a bad component. stale: The component is syncing because it was stale. The vSAN NAA Latency dashboard (added in SexiGraf 0.99b) let you check the individual latencies of every single device in the vSAN cluster sorted by Network Addressing Authority identifier. 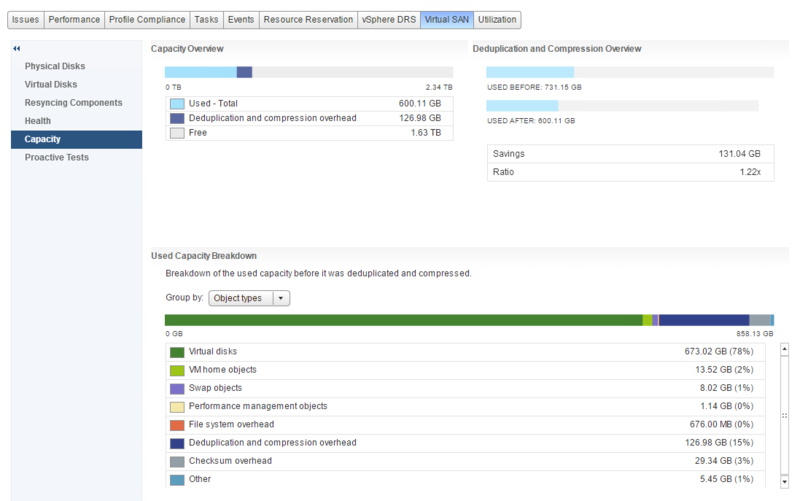 In SexiGraf 0.99b we added an enhanced version of the initial vSAN Capacity dashboard. 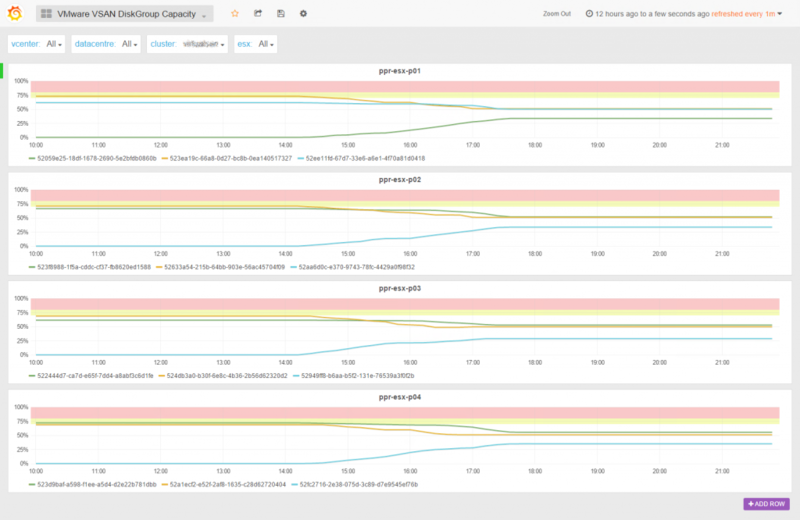 The vSAN DiskGroup Capacity let you monitor the space usage of each diskgroup of each cluster node. Now you see what is going on when you manually initiate Proactive Rebalance. You should check the excellent Cormac’s blog post regarding the role of each object type but also the SDK documentation to match with the “interal” property names.